Alternating current (a.c.) is the backbone of modern electrical power distribution. In this article I’ll be pulling some of the more important concepts together. It is a work in progress and I’ll be adding to it bit by bit as I start closing pages down in the Wiki. Hopefully by the time the Wiki is fully depreciated, we should have a reasonable article here. Note: In the Europe, the frequency is 50 Hz (period to 20 mS), while in the US it is 60 Hz (period 16.67 mS). The average voltage or current of a pure sine wave is zero. Even though the average is zero the power delivered by an AC source is not zero. The root-mean-square (rms) values of current voltage and current equate the power delivered by the AC circuit. The average value of a sine wave is 0.637 of the maximum. 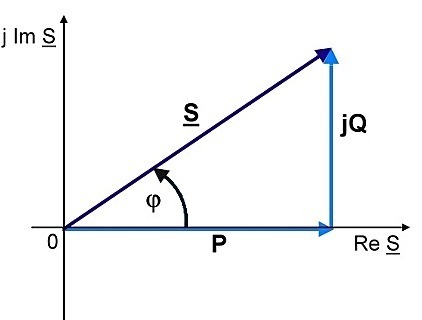 The quantity P, represents the real power transmitted in the system. This is the power that actually does work (i.e. rotating motors, heating homes, etc.). The reactive power Q, does not do actual real work, but is responsible for maintaining the magnetic and electric fields of the electrical system. These fields provided the energy storage mechanisms necessary for the distribution system to work. The magnitude of the complex power S, is often referred to as apparent power. If the current is lagging the voltage in phase (for example in an inductive circuit) the power factor is said to be lagging. Conversely if the current leads the voltage the power factor is said to be leading. 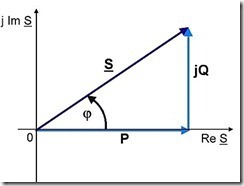 For a power factor of 1, the real and apparent power will be the same, with the reactive power being equal to zero. As the power factor is reduce, more reactive power in the system is required. Generation of reactive power required additional equipment, increasing transmission system costs and operating energy loss. By ensuring high power factors these costs and loses are reduced. The three main components to an alternating current (ac) system are resistance, inductance and capacitance. The resistance of an alternating current circuit is denoted by the symbol R.